The Amish Rustic Knotty Pine Fireplace casts a cozy glow over any room! 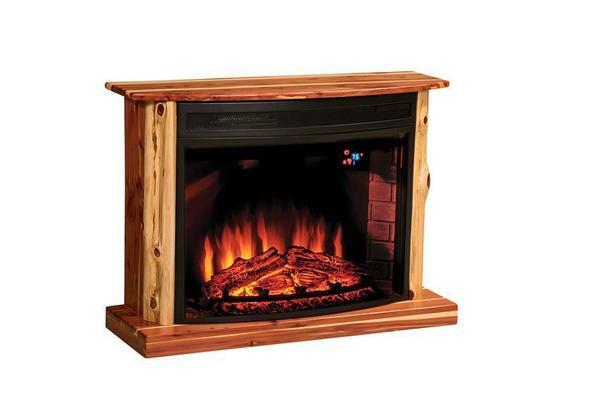 Enjoy the rugged warmth of this LED fireplace in your living room, den or bedroom. Up the temperature with the handy remote control from your living room couch or your comfortable bed. Handcrafted by the Amish, this fireplace heater is made from knotty pine wood, contributing easily to your country decor. A simple and natural look is displayed with this design, emitting a warm welcome as you enter the room. Create an inviting display on the mantel of this pine fireplace with family photos and candles. Take a look at our Amish TV Stands to complete your living room furniture collection. This rustic fireplace unit has hidden casters that allow it to be transported easily from room to room. Provide the focal point for family fun times with this Amish made heater to bring the family together. Call us today with any questions at 866-272-6773 or visit our DutchCrafters Furniture Store in Sarasota, Florida to experience Amish furniture firsthand.